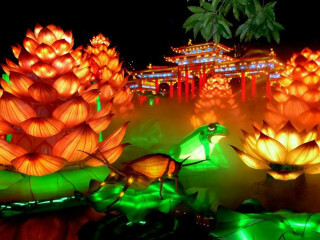 After an ultra-popular debut in 2012, the Chinese Lantern Festival is set to ignite the lagoon at Fair Park all over again - this time with 25 spectacular lantern displays. Visitors will be able to view an exhibit with 17 new scenes, including dragons, dinosaurs, tulips, flamingos and even a herd of longhorn cattle. During the State Fair, the Chinese Lantern Festival will be a paid attraction separate from the State Fair entry, with entry by food & ride coupons only: $14 for adults, and $9 for children (aged 4-12). The good news is the price will remain the same, daytime or nighttime, and visitors will be allowed to re-enter the Festival as often as they wish on the same day. Organizers are offering a Texas-sized discount on admission during the Fair, knowing folks are passing through two gates to see the magnificent creations. After the Fair, the exhibit will only be open at night. Tickets will be $22 for adults and $14 for children, available in person at the Festival and via the website at www.chineselanternfestival.com. $9-$14 during State Fair, $14-$22 after State Fair.